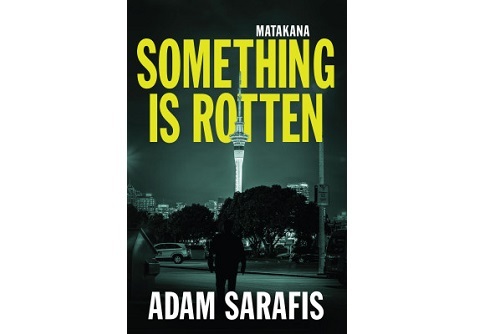 Adam Sarafis is the pseudonym for Swedish author Linda Olsson, who lives in New Zealand and the New Zealand born author Thomas Sainsbury. Something is Rotten is the first part in a planned trilogy. A young man is found dead at a library in Auckland. The police think it was a suicide, but a friend of the man is convinced it was murder and asks Sam Hallsberg, former government advisor on terrorism now working as car mechanic, for help. Meanwhile, Lynette Church, one of the country’s best journalists, embarks on an investigation into the past of one of New Zealand’s most powerful businessmen. This is a pure thriller. Innocent people stumble on a mystery/conspiracy, get into trouble and then they are chased while they search for the truth. New Zealand is a whole new crime fiction setting for me, so that felt new and exciting, which made up for some clichés and the fact that this is not the first ragged/traumatized man we have seen as the main character. But when the plot got underway it mattered less. I kept turning the pages to find out what would happen to the characters and that is after all the main purpose of a thriller. The result is an ok thriller with plenty of questions and threads to follow up on in part two and three of the trilogy.